Love of a vast, windswept heath known as The Peel keeps Pieter Verstappen focussed on that particular part of the Dutch province of Limburg, where the artist was born and raised. There, far removed from the hustle and bustle of urban life, a man can feel free. Loving nature means one wants to be out of doors as often as possible to experience the changing seasons and the alternating moods of The Peel. By following closely the ways of wild creatures, he observes how their lives unfold. Nature is his teacher. 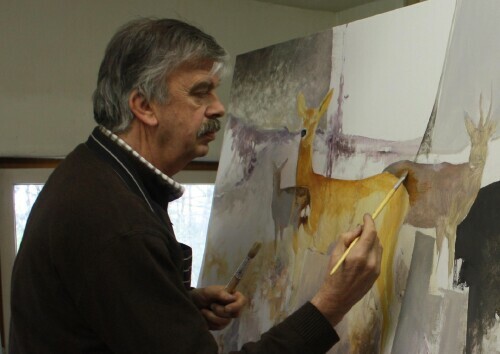 As an artist, Verstappen attempts to capture each individual trait of the animals that fascinate him, observing them when at rest, at play and during the hunt. The intricate feather patterns of a snipe near a pool, the play of light and shade on the rump of a resting curlew all serve to inspire him. One must be alone to submerge oneself in what nature has to offer.